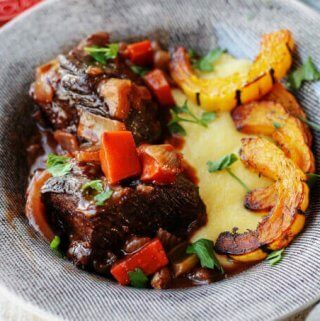 Red Wine Braised Short Ribs with Parmesan Polenta and Roasted Delicata Squash, is a super flavorful dinner idea that will make you feel warm and cozy on a cold, winter night. 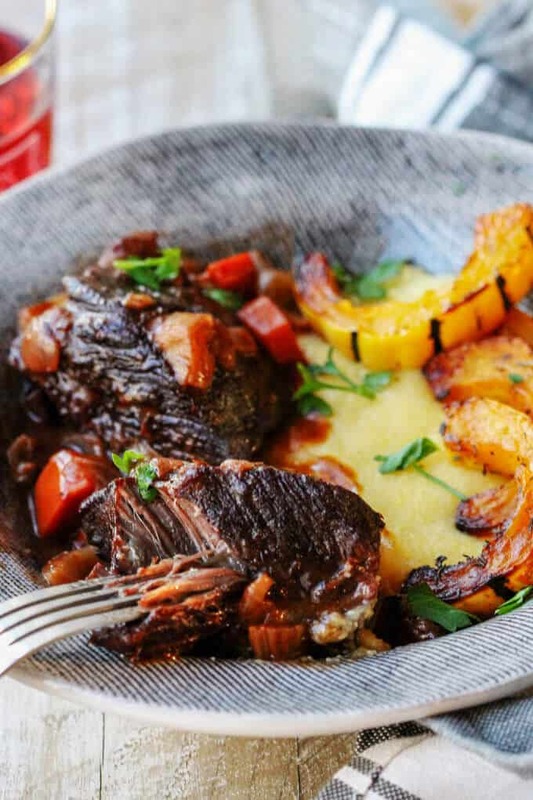 Red Wine Braised Short Ribs with Parmesan Polenta and Roasted Delicata Squash – perfect dinner for cold winter nights. 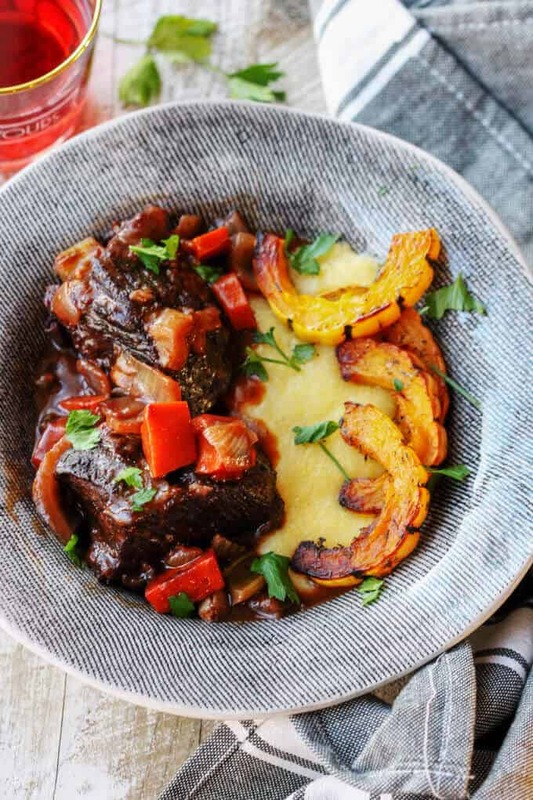 I made these Red Wine Braised Short Ribs with Parmesan Polenta and Roasted Delicata Squash for dinner shortly after we were thrust back into a frigid NY temps, from having spent a week basking in the Florida sun. During this time of year, we always crank up the heat in the house, have some hot tea and cravings for belly-warming dinners. This dish fit the bill perfectly. In fact, I had red wine already opened and decided that I need to use it to braise some delicious meat. 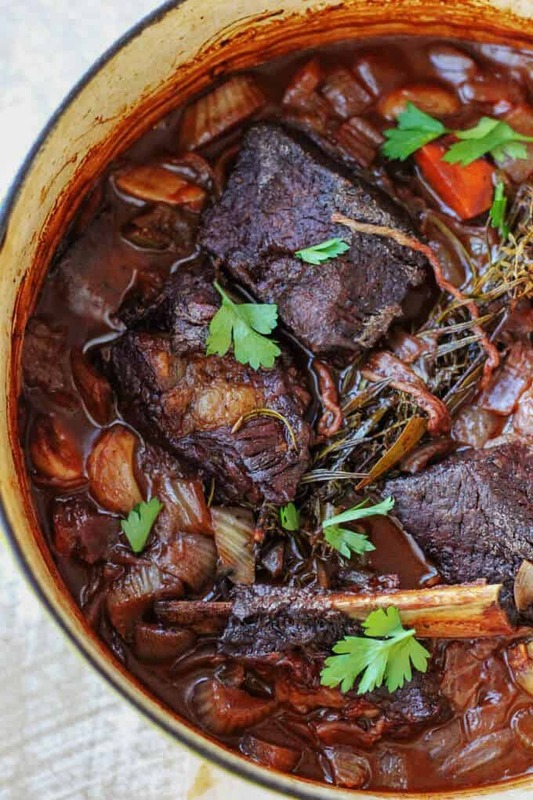 I told my husband, that I’m making red wine braised short ribs and he just couldn’t wait for the final product. Digressing for a second here… I’m so jealous of everyone who lives in a sunny state of Florida. It always seems so nice there. It seems like everything is cleaner: the roads, the trees, the birds… Oh yeah, I’m also obsessed with watching diving pelicans. It’s the coolest thing ever! The only thing that terrifies me about Florida is the hurricane season. Other then that I could totally envision myself living there. My in-laws moved from Connecticut to Siesta Key and they are living the dream (a really nice way to retire). Good for them. I hope to be in their shoes one day. This trip was also the first time for me spending Thanksgiving in tropics. It was interesting to see Xmas decorations popping up right after Thanksgiving and surrounded by palm trees. This was also the first time I wasn’t cooking for Thanksgiving. Even though I do love cooking, and you can see it in my collection of My Favorite Thanksgiving recipes, it was a nice change of pace. With two little boys I really enjoyed and appreciated a stress-free Thanksgiving. I have a thing about cooked fennel. Whether it’s roasted or cooked in a stew, the raw liquorish taste cooks out to create some amazingly sweet deliciousness. I can’t even describe it; it’s just awesome. I use it as often as I can. 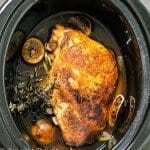 If you like fennel like me, you may also like this Fennel Chicken Mediterranean Style recipe. It’s insane! Anyhow, for these red wine braised short ribs I used A LOT of wine. It was a heaping 2 cups of wine. And my other secret ingredient was: CINNAMON. It is so warming and elevates a dish to a totally different level. I use it often in my cooking. It’s huge in Greek cuisine which is one of my favorites. As a side, I also served roasted delicata squash. It’s very flavorful and requires almost no work. You’ll just need to cut it into 1/2 moon shapes and get rid of the seeds. Then, season with salt & pepper, dried thyme, drizzle with olive oil and roast for 20 minutes. I braised my meat in the oven, so I popped the squash in the oven for the last 20 minutes of the braising process. The squash was a really nice addition to this very rich meat dinner with parmesan polenta. If you’re looking for some a warming/hearty meal, look no further. 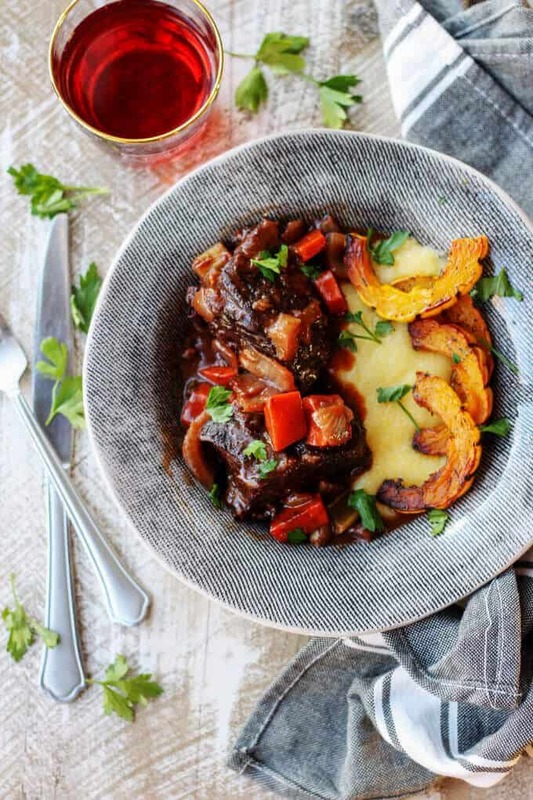 I’m confident that you will fall in love with my version of Red Wine Braised Short Ribs with Parmesan Polenta and Roasted Delicata Squash. Enjoy! Heat up the oven to 350F. 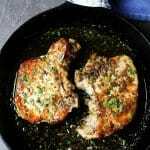 In a Dutch Oven or other braising pot heat up a cooking oil. Season short ribs with salt and pepper on each side and add to to pot. Brown the meat on each side for a couple of minutes. Once the meat is browned remove it from the pot and set aside. Remove all but a tablespoon of fat from a pot and add chopped onions. Cook for about 2 minutes. Add tomato paste and flour and mix everything together. Cook for 3 minutes. Add red wine and cinnamon and place meat back into the pot with all the juices. Cook for about 15 minutes until wine is slightly evaporated. Add beef broth, cover with tide lid and transfer to oven. Braise for 2 hours. Serve with Parmesan Polenta and Roasted Delicata Squash. Add Parmesan Cheese, salt and pepper and mix well. Place cut up squash on a baking sheet with parchment paper. Add olive oil, thyme, salt and pepper, mix well and add to the 350F oven. Bake for 20 minutes. Polenta cooks quickly so start working on it when there is about 15 minutes left for meat braising process. Add delicata squash to the oven with braising meat when there is about 20 minutes left for meat bracing process. I’m getting ready for -30 winter weather here in Canada and these look perfect for those cozy nights I’ll be having wrapped up in a cozy blanket. 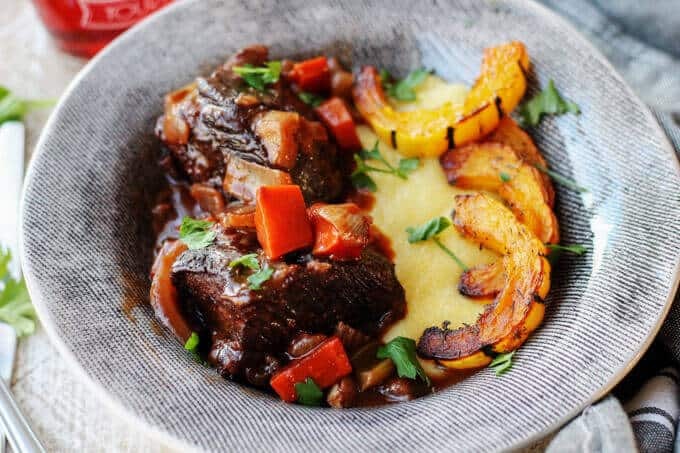 I love short ribs and these look so melt in your mouth good with a spoonful of that cheesy polenta! My mouth is watering! I love everything about this, especially the roasted delicata squash! This combination is amazing! That meat looks so juicy and filled with flavor. I always make short ribs every weekend! This recipe looks good! Tender meat! 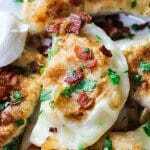 This is a terrific recipe to serve guests. The fennel was a surprise, but I’m sure it really added a great touch to the dish. Yes it did. Fennel and cinnamon made a difference 🙂 Thanks Leslie.